But it doesn’t matter. I tried, tried, and tried again. It’s still a no. 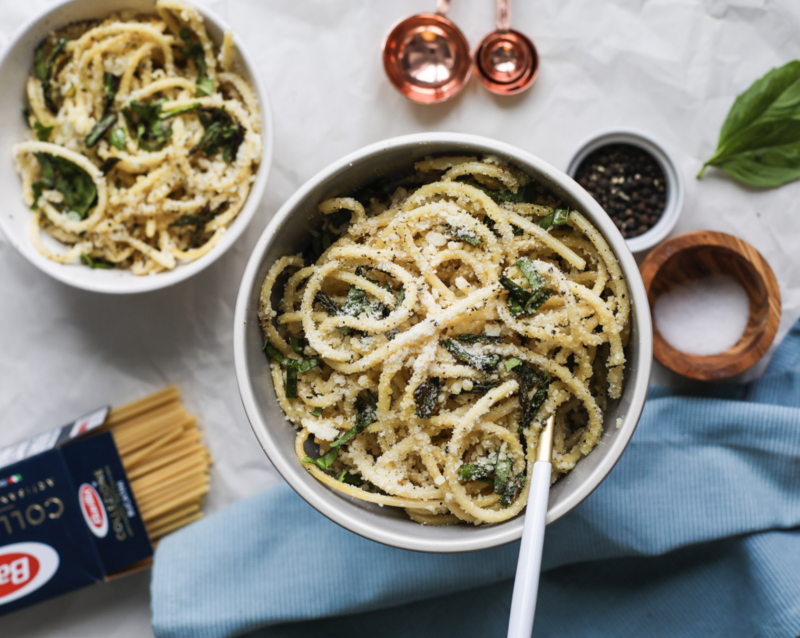 Because of this fact, when Barilla(R) (a maker of pasta) asked us to create a Carbonara pasta recipe in celebration of Carbonara Day on April 6, I had to put my creative cap on… tight. Why? Carbonara is an Italian pasta dish from Rome made with egg, hard cheese and bacon. Obviously, bacon is not my jam (hence the plant-powered mission behind this platform). The real problem, though, is that most vegetarian Carbonara dishes replace the bacon with mushrooms. Sadly, not happening. So, what does a mushroom-hating vegetarian girl like me do in lieu of bacon and mushrooms? ASPARAGUS. Duh. It’s crunchy, green, delicious, & nutritious — the perfect Carbonara accent vegetable. Without further ado, we present An Egg-Free Vegetarian Carbonara Pasta w/ Roasted Asparagus using Barilla Collezione Bucatini. And I have to say, I kind of agree with Bon Appetit’s statement that Bucatini is “the best long pasta that there ever was or will be”. 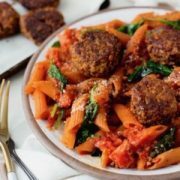 When cooked al dente, it offers the perfect chewy texture that elevates any dish tenfold. BTW, this recipe is SUPER simple to make. But enough with the talking. 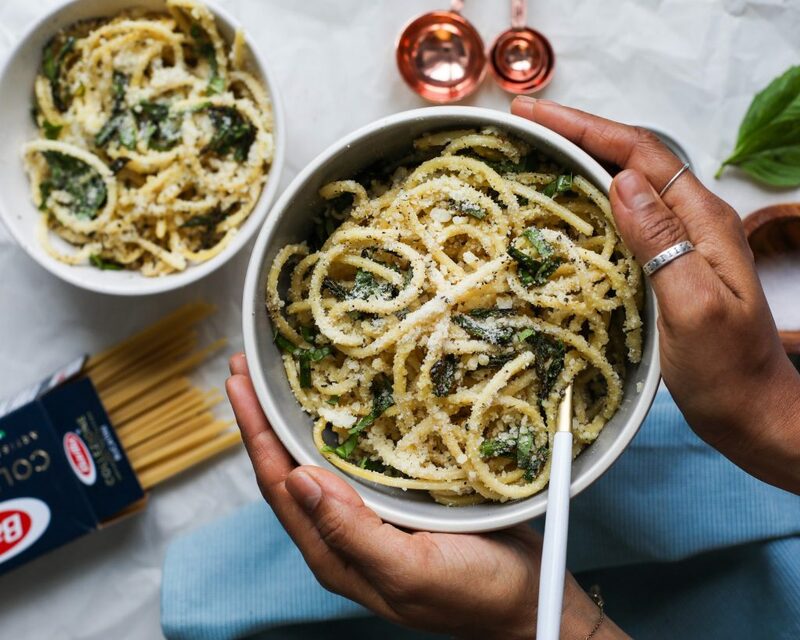 Ready to eat more pasta? Here’s what you do: Start by soaking 1 cup of cashews in 2 cups of water for 1 hour. Preheat the oven to 415F, then lay asparagus on a baking sheet. Drizzle 1 teaspoon of olive oil onto the asparagus and top with salt and pepper. Roast for about 10 minutes or until the tops of asparagus start to crisp. Next, we’re going to cook the pasta. Bring 4-6 quarts of water to a boil. Add salt to taste, then add the pasta to boiling water. For authentic “al dente” pasta, boil for 7 minutes, stirring occasionally. For more tender pasta boil an additional minute. While the pasta is boiling, get out a pan and sauté the chopped onions in 2 teaspoons of olive oil over medium heat for 1-2 minutes or until fragrant. Add the chopped garlic and cook for another 1-2 minutes, continue to stir. Once the cashews are done soaking, add 1 cup of cashews and 1 cup of soaking water in a high-speed blender or food processor. Add the cooked onions, garlic and almond milk and pulse/blend until creamy. Remove the sauce from the food processor and mix with the cooked pasta. Squeeze the juice of ½ lemon on top and stir. Then sprinkle in parmesan cheese or nutritional yeast, and pepper and onion powder. Next, chop half of the cooked asparagus into ½-inch pieces. Mix throughout pasta. Serve the other half of the cooked asparagus as a side. Lastly, if you want to add basil, chop it now then sprinkle on top. Enjoy! Start by soaking 1 cup of cashews in 2 cups of water for 1 hour. 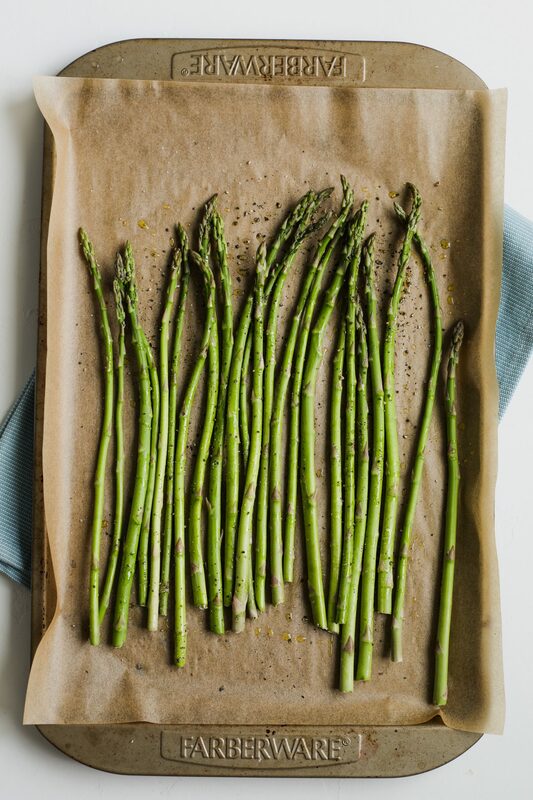 Preheat the oven to 415F, then lay asparagus on a baking sheet. 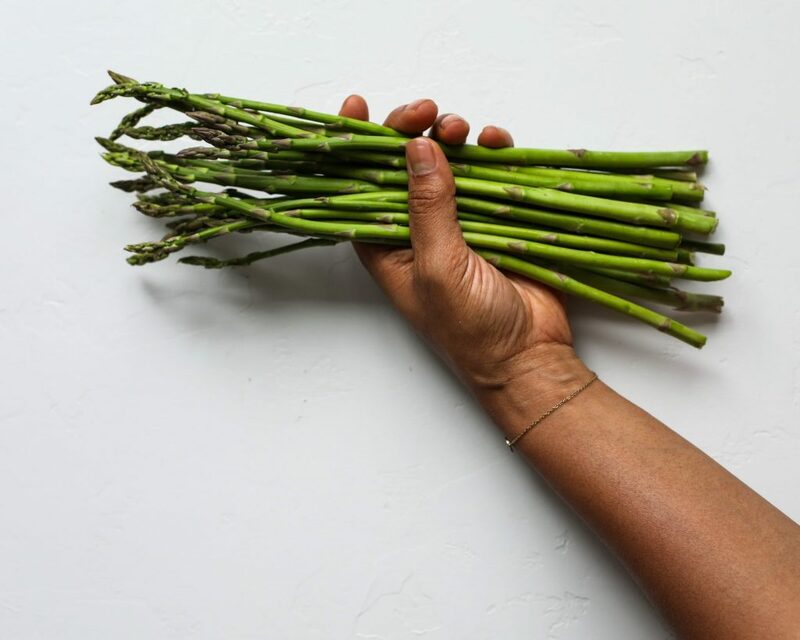 Drizzle 1 teaspoon of olive oil onto the asparagus and top with salt and pepper. Roast for about 10 minutes or until the tops of asparagus start to crisp.Next we’re going to cook the pasta. Bring 4-6 quarts of water to a boil. Add salt to taste, then add the pasta to boiling water. For authentic “al dente” pasta, boil for 7 minutes, stirring occasionally. For more tender pasta boil an additional minute. While the pasta is boiling, get out a pan and sauté the chopped onions in 2 teaspoons of olive oil over medium heat for 1-2 minutes or until fragrant. Add the chopped garlic and cook for another 1-2 minutes, continue to stir. Once the cashews are done soaking, add 1 cup of cashews and 1 cup of soaking water in a high-speed blender or food processor. Add the cooked onions, garlic and almond milk and pulse/blend until creamy. Remove the sauce from the food processor and mix with the cooked pasta. Squeeze the juice of ½ lemon on top and stir. Then sprinkle in parmesan cheese or nutritional yeast, and pepper and onion powder. Next, chop half of the cooked asparagus into ½-inch pieces. Mix throughout pasta. Serve the other half of the cooked asparagus as a side. Lastly, if you want to add basil, chop it now then sprinkle on top.